Some of the hottest cars to hit the scene in 2011 make their way to showrooms this spring. Here is a list ,which will make you dream of owning one starting with Bugatti Veyron 16.4 Super Sport the world's fastest production car (it hit 268 miles per hour last summer in Germany) but it is also one of the most refined--with interior cues taken from its sister company, Bentley. Its cockpit is wrapped in hand-stitched soft-grain leather and trimmed to the hilt in carbon-fiber; the rear-view camera, Bluetooth capability and Satellite radio make driving to the store a pleasant experience rather than the sweat- and stress-inducing jolt provided by other exotic autos. Exterior of Super Sport's is too hot, with bold lines that look modern but evoke Bugattis from the 1920s and '30s . At a retail price of $2.5 million, only the world's wealthiest people can afford to put a Super Sport in their garages. Ferrari's street-legal 599XX variant, the GTO, the elegant Audi R8 Spyder 5.2 FSI Quattro and McLaren's first-ever solo production car, the MP4-12C, will quicken lots of heart rates when they hit the streets next year. A common thread between some of the hottest new cars is an emphasis on weight control. Almost every car in 2011 including the Range Rover Evoque, boasts a streamlined frame, light-as-air carbon fiber components or a super-efficient, whittled down engine. More emphasis on Fuel efficiency. Porsche's latest 911 variant, the lightening-quick GT2 RS, embraces that ethic. The BMW 1 Series M Coupe is also lighter than its closest family member, the M3. The much-anticipated Chevrolet Camaro Convertible, a Detroit-made animal whose $75,000 limited-edition Neiman Marcus variant sold out in three minutes last month. The standard version will have a 312-horsepower V6 engine and will go to production in the first quarter of 2011. There will also be a V8 SS option, which will likely be priced near $36,000. Sure the Camaro packs a lot less punch than the Super Sport, as will even Lamborghini's Jota, the code-named successor to the Murcielago coupe. But for drivers in need of an ego boost next year, either will easily do the trick. Hybrid Efficiency Meets Lincoln Luxury in the 2011 Lincoln MKZ Hybrid. The all-new 2011 Lincoln MKZ Hybrid -is the most fuel-efficient luxury car in America. It features 39 combined mpg.The front-wheel-drive 2011 Lincoln MKZ Hybrid is also, on average, more than 50 percent more fuel-efficient than other luxury cars. On top of that, the 2011 Lincoln MKZ Hybrid delivers over 700 city miles on a single tank of gas. Lincoln has always been synonymous with luxury. 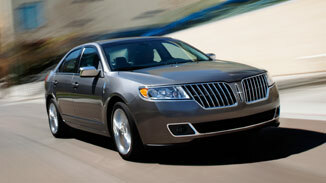 In fact, the 2011 Lincoln MKZ Hybrid has more standard luxury. Features include the SYNC® voice-activated communications and entertainment system, walnut swirl or olive ash wood trim and Bridge of Weir leather-trimmed seating. This leather employs a chromium-free tanning process and can be recycled at the end of its life. And the wood trim comes from forests that are managed to strict environmental, social and economic standards. The 2011 Lincoln MKZ features the standard dual-LCD SmartGauge™ with EcoGuide that provides feedback on fuel efficiency and your driving performance. It has a full-color display with leaves that appear or fade in real time based on short-term driving efficiency. As your driving becomes more efficient over the long term, flower blossoms appear in the display.